A small, multi-stemmed tree. It is native to the moist woodlands of the Pacific Northwest, but will adapt to drier and sunnier locations. 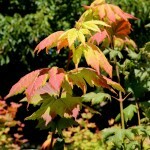 Summer foliage is green; colors in the early fall to bright reds, oranges, and yellow. The foliage is borne on spreading limbs (hence the name). The flowers are small, reddish and purple. 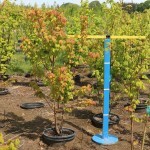 It prefers some shade with some summer moisture, and it is very adaptable to many sites.